Three days after a police officer shot and killed an unarmed 18-year-old man, tensions are high in the St. Louis suburb where it happened, prompting the federal government to get more involved. President Obama released a statement late Tuesday afternoon, calling the shooting death of Michael Brown by a Ferguson, Mo., police officer on Saturday "heartbreaking." "I know the events of the past few days have prompted strong passions, but as details unfold, I urge everyone in Ferguson, Missouri, and across the country, to remember this young man through reflection and understanding," the president said. "We should comfort each other and talk with one another in a way that heals, not in a way that wounds." Also on Tuesday afternoon, the Federal Aviation Administration announced flight restrictions over Ferguson, banning pilots from flying less than 3,000 feet above the St. Louis suburb until Monday. The reason given for the no-fly was "to provide a safe environment for law enforcement activities." A spokesman for the St. Louis County Police Department, which has led crowd control efforts in Ferguson, told Ars Technica's Cyrus Farivar that the department requested the no-fly zone after its helicopter was fired at several times during protests Sunday night. The helicopter was not struck by the gunfire. An explanation from the department's helicopter dispatcher to ThinkProgress suggests that the restriction was meant to, at least in part, clear the air of reporters. "It's just for a no-fly zone because we have multiple helicopters maneuvering in the area and we were having some problems with news aircrafts flying around there," the dispatcher said. Brown's death has sparked a series of protests by Ferguson residents, and law enforcement has responded with crowd-control practices like the use of tear gas and rubber bullets. The Justice Department announced Monday that FBI agents were helping local law enforcement in its investigation of the shooting. The circumstances of Brown's death remain unclear. Local police say Brown assaulted the officer. Eyewitnesses, including a friend of the victim who was there at the time of the shooting, say Brown was running away from the officer when he was killed. 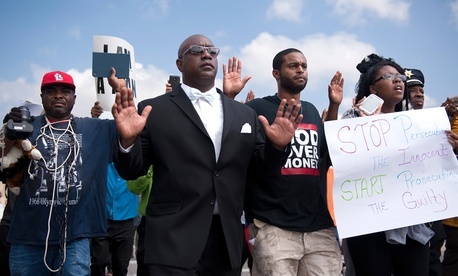 Protests are expected to continue in Ferguson on Tuesday night. "And this is only day three," a man told The Washington Post's Wesley Lowery as he reported from the scene Monday night, tear-gas canisters thrown by police flying past him.